ERFAHRUNG tropisches Paradies! Von der großen Wrap-around-Lanai haben Sie einen herrlichen unverbauten Blick, wo Sie spektakuläre Sonnenuntergänge Jahr über genießen, beobachten Wale speienden im Winter und spielerische Delphin das ganze Jahr. Unsere Eckeinheit im Erdgeschoss, die nur wenige Schritte vom Meer entfernt liegt, gilt als der beste Ort beim Surf and Racquet; Es ist sehr privat. Die geräumigen Wohn- und Essbereiche öffnen sich auf die große Veranda, wo Sie im Freien speisen und einen unvergesslichen Panoramablick auf die Küste und unvergessliche Sonnenuntergänge genießen können. Von der Veranda Sie Schritt auf einem üppigen Rasen mit dem Ozean nur einige Meter entfernt. Das Schlafzimmer verfügt über ein Kingsize-Bett mit Blick auf den Ozean. Die Gäste-Schlafzimmer hat zwei Einzelbetten. Die gut ausgestattete Küche verfügt auch über einen Meerblick. Es gibt gesicherte High-Speed ​​Wireless-Internet-Service für Ihren Laptop. Ihr zugewiesenen Parkplatz ist nur wenige Schritte von der Haustür ... nein schleppen schwere Gepäck und Lebensmittel jede Entfernung oder Treppensteigen. Dies ist ein Nichtraucher-Gerät und keine Haustiere erlaubt. Die prestigeträchtigen Gated Oceanfront Keauhou-Kona Surf and Racquet Club liegt in einer Gartenanlage auf 17 Morgen an den Pazifischen Ozean und dem Weltklasse-Kona Country Club Golfplatz umgeben. Es gibt drei beleuchtete Tennisplätze (kostenlos), Schwimmbad, Picknick-Bereich, Gas-und Holzkohlegrills. Sie sind nur wenige Gehminuten von Einkaufsmöglichkeiten, Restaurants, Multiplex-Kino und Kahalu'u Beach, für das beste Schnorcheln auf der Insel. We were here for the Ironman World Championship and this Condo gave us a genuine Hawaiian vacation feel instead of just a place to stay for the race. This Condo is an end unit and I think we had one of the best locations of all the units. The end unit has a larger lanai than the others and location was mostly secluded from others. We had a front row seat of the Ocean and the sunsets were absolutely amazing! The owners provided great information about the Condo and local area prior to our arrival and they were very responsive to any questions and issues during our stay. We definitely recommend this Condo and will stay here again when we return! This ground floor condo is top drawer! I don't think there is a better spot on the entire Kona coast! This condo has it all! We absolutely loved the wrap around lanai affording fantastic views. We also enjoyed the little adjacent grassy area which is perfect for bird watching! The condo itself is so clean and comfortable. The beautifully furnished Hawaiian decor made us feel like we were really living the island dream! If you enjoy cooking or entertaining, you're in luck! This kitchen has everything you need and then some, including a view of the water while you are preparing your meal! Be sure to check out all the beach stuff in the back bedroom closet. Time to tear yourself away form the lanai and hit the water! Just down the road is Keauhou Bay. We booked a snorkeling expedition to Honaunau and Kealakekua Bay that departs from Keauhou Bay. It was the Deluxe Morning Adventure on a zodiac through Sea Quest. I give it a solid 10! Practice your snorkeling skills first, though, at Kahalu'u Beach Park only a half mile away! Finally, our host, Diane, was so accommodating and helpful. She made us feel at home even before we arrived! There was only one problem....we didn't ever want to leave! Mahalo, Diane, we'll be back! Wonderful unit with amazing views. My husband and I spent five great days in this excellent condo. As other reviewers have noted, the condo really does look as good as the photos. The location is perfect — in a quiet part of the complex, right next to the ocean (great for enjoying the sunset on the lanai) and near a good supermarket and snorkeling beach. Everything in the condo is clean and well maintained, with the washer and dryer an added benefit. The kitchen is well stocked for cooking. There is no air conditioning, but by leaving windows open the temperature was quite comfortable at all times. The hosts were very accessible to answer questions and allowed us to extend our stay by one night when we had to cancel our planned visit to Volcano. We would love to return and stay longer! We had a good time staying at their condo. The location is good. There is grocery store next block. The condo is facing the Pacific Ocean. The house was clean with plenty of supplies. We used their cooler and snorkeling gears. Seeing the sunset and listening to rock-crashing waves were priceless. The unit is a little outdated but overall not bad. There were little flies in the bedroom that seemed to crawl all over the dressers but it may be the time of year, not sure as I’ve never been to this island before. Loved loved loved the location (about a 5-10 min drive to Kona depending on traffic) Grocery store close by as well. The view and the lanai were out of this world. 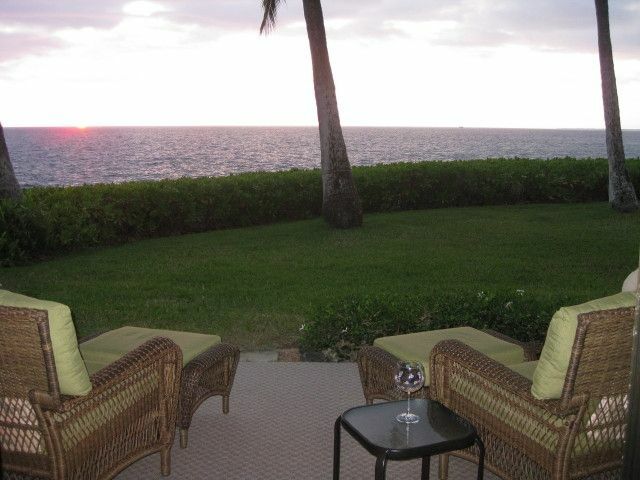 I was with my mom and we would sit with our wine every night and watch stunning sunsets right on our lanai. They have chairs, umbrellas and boogie boards there as well as a couple of coolers for going to the beaches. The pool was great too. If i was rating on the view, lanai and privateness of this unit it would get a 5 star for sure. The biggest issue I had is the cleanliness of the unit. Now I;m not the cleanest person on the earth nor am I a clean freak but there were certain areas where the dust was so thick I’m sure its done, if at all maybe once a year like behind the bed and dressers and in the closets and the blinds. When you have to pay a cleaning fee......I feel a little jipped and as i expect a little cleaner than what I got. Because it is a cleaning company involved, the owners may not be aware of the quality of work being done. But the sheets and towels were clean, the tub and toilets were clean and for the most part the kitchen was clean as well. i would stay here again for the view alone and bring more essential oils as the flies didn’t bother me but I had my essential oils on my dresser lol. 100% refund if cancelled at least 60 days before arrival date. Please call us with any questions you may have. 703-278-8465 or 703-475-0028 (cell).